Though I never tire of roasted Brussels sprouts, I'm always looking for new ways to consume the little cabbage-like orbs. 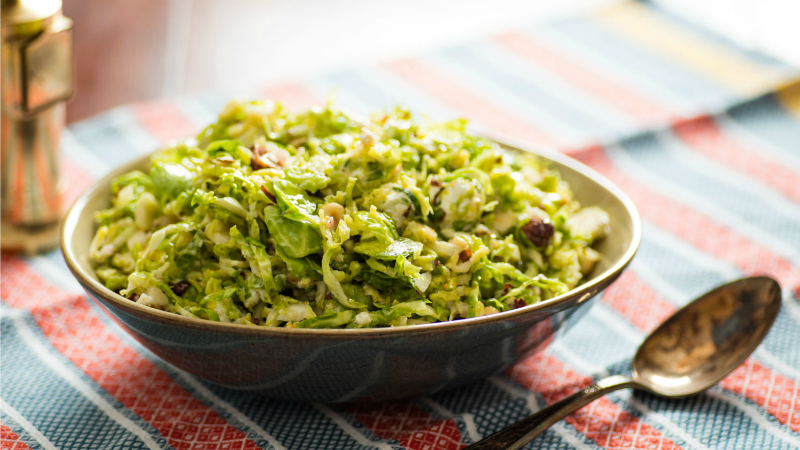 Shredded sprouts make a nice, sturdy salad base, but they're almost too sturdy. To make salad that's both tender and crisp, you'll need to grab the salt shaker. As it happened, though, I'd just been working on a sauerkraut how-to. The method starts by tossing and kneading shredded cabbage with salt, which wilts it through the powers of osmosis (the salt draws out moisture from the cabbage's cells, collapsing them) and the mechanical crushing of the cells through the kneading itself.